"Nowhere was the problem of turnover and absenteeism more severe than in the factory of Henry Ford, where workers' dissatisfaction was running dangerously high. 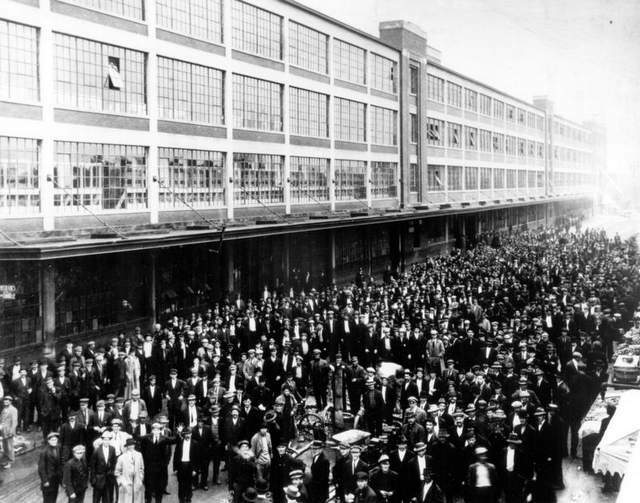 Absenteeism in the Ford plant in 1913 had reached 10.5 percent. There was ... no charity involved. ... We wanted to pay these wages so that business would be on a lasting foundation. We were building for the future. A low wage busi­ness is always insecure. The payment of $5 a day for an eight-hour day was one of the finest cost-cutting moves we ever made. "Although Ford based his policy on sound business principles, the business com­munity was aghast at his behavior, excoriating Ford as a 'mad socialist' and a 'traitor to his class.' The Wall Street Journal and other financial papers enthusiastically joined in the attack. "Nonetheless, the $5 wage was a brilliant stroke of capitalist genius. In 1914, the first year after Ford began the $5 wage, turnover fell dramatically to 54 percent, By 1915, it dropped still further to 16 percent. Absenteeism also subsided, falling to 0.4 percent in 1914. "For example, the company had to be 'satisfied that he [ the qualified worker] will not debauch the additional money he receives.' Toward this end, the Sociological Department had to be certain that the workers maintained a suitable home, refrained from taking in boarders, operated no outside business, made sure that the family did not associate with the wrong people, avoided excessive smok­ing or drinking, and demonstrated adequate progress in learning English. In addi­tion, wives of qualified workers could not work outside of the home. Furthermore, the inspectors had to determine whether the workers displayed suf­ficient thrift, cleanliness, 'good manhood,' and good citizenship. Workers also had to tend gardens that the inspectors deemed to be adequate. Not surprising­ly, during the first two years, 28 percent of all male workers were disqualified from profit sharing. "Ford also expected that this obedience would translate into greater effort from the workers. A production foreman named W. Klann reported, '[They] called us in and said that since the workers were getting twice the wages, (the management) wanted twice as much work. On the assembly lines, we just simply turned up the speed of the lines.' "
akhilesh.vyawahare@gmail.com - And so what have you added to the discussion? You offer how much you agree with me (60%,) which is pointless, and a nostalgic tidbit of admiration for Ford based on a dubious presumption. Don't take me wrong, I welcome feedback to the degree to which is useful. Ford was not in danger of closing, it was just not maximally profitable. The move was brilliant but was not about survival. A survival threat would have been a lack of available replacement hires - Ford had a plentiful stream. There is nothing to prove that trying to engineer workers home lives or not including women was anything other than the peculiar preferences of Ford, who was a social eugenicist. I think JohnSmith is (may be 60%) correct on his part, however, in a situation where Ford's company was going through, it was really a brilliant move to keep the company alive. Of course the counterpoint to this piece is that if you ask people today about these events, they simply parrot, "Henry Ford raised worker wages." The story of history is in the details many people overlook, substituting popular myth as filler. Explanations include disinterest, laziness, or lack of drive to leave one's comfort zone to educate oneself or just innocence. Conversely, the popular history filler is often driven into people's head intentionally by interested parties such as business. The salient feature here is that individuals are less well coordinated than, and so at the mercy of, entities that manipulate public perception and awareness as a profession. Ford's workers were heavily manipulated, intentionally propagandized, divided as a body, and lured by duplicitous offers of wealth. This is telling; business is willing to rearrange lives, families, and cultures in pursuit of profit. In 1915 people understood this because they lived the change. Soon afterward came the labor movement and labor unrest that put some power into the hands of industrial labor. Business reacted to worker demands for fairness with a scientifically planned and professionally engineered assault on organized labor, and today it can be claimed business won the propaganda war. Public perception of labor unions is negative, to the extent that workers actually act against their own interests and have lost the connection to the autonomy over their own lives that was normal in the past. An interesting specific example of the forces used against workers is the "Mohawk Valley Formula" for strike breaking engineered by the Rand Corporation in the 1930s.